Thanks for the heads up. Great deal. Pity there isn't any of the hybrid watches on sale but still some fab watches for under 70 quid...bargain! Hi, might be a stupid question but where do you put in the code? Having problems adding a watch to basket, anyone else having the same problem? Having problems adding a watch to basket, anyone else having the same …Having problems adding a watch to basket, anyone else having the same problem? Can't find the place for the code nowhere. I don't think you can use the code on sale items. I couldnt see it when trying to order via a mobile, on desktop it was when i went to my basket you can see it. Brilliant - got a very nice one for £36! 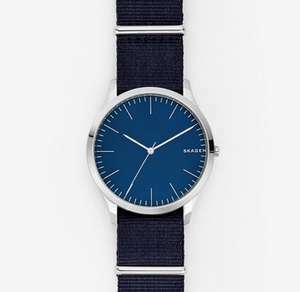 I never realised there were so many fellow Skagen lovers on here. Got the discount. A couple wouldn’t add to basket thing the might be oos. Be mindful of returns. You have to pay postage if you simply change your mind and want to send something back. Yup agree, just needs to be done on the proper website rather than the mobile version. Still not delivered and now not replying to any emails as to the whereabouts of my order. I'll never use this company again. Still not delivered and now not replying to any emails as to the …Still not delivered and now not replying to any emails as to the whereabouts of my order. I'll never use this company again. Only fair to Skagen to give you an update...Watch was found hidden under some things in the garage. It had been delivered by UPS with no note through door as to where it was. Skagen told me that UPS delivery note said it had been signed for by Mr Garrage!